It may become necessary to raise the age limit for drivers of heavy vehicles such as lorries and buses to curb the rising number of deadly accidents, National Council for Road Safety Chairman has said. Dr Sisira Kodagoda told the Sunday Times that inexperienced youth between the ages of 26 and 28 drive heavy vehicles in a reckless manner leading to severe accidents. He said driver-training was also not satisfactory. He charged that many private bus drivers were driving under the influence of drugs which was one of the main reasons for accidents especially during day time. Weak eyesight was also a reason for accidents by night. Dr. Kodagoda said these drivers usually wear their spectacles when undergoing their driving tests but do not do so once they start driving. In addition many drivers suffered from chronic diseases such as diabetes. Private buses and lorries account for the majority of heavy vehicle accidents. 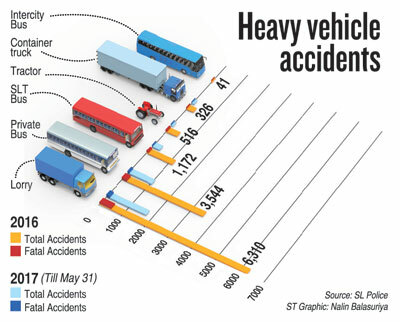 Of the 953 fatal heavy accidents last year, lorries accounted for 523 while 233 involved private buses. This year from January to May 31, of the 300 fatal heavy vehicle accidents, 157 involved lorries, while private buses accounted for 82 crashes. Meanwhile police said driving under the influence of alcohol was a major reason for accidents involving heavy vehicles. 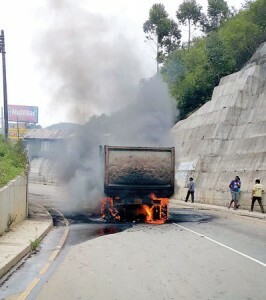 A tipper truck travels around 200 to 300 kilometres a day transporting around 15 tonnes and many were not roadworthy as they ply long hours on rough terrain which cause severe damage to parts including tyres, engine, and brake linings, police said. Meanwhile, the failure rate of the annual medical exam for drivers of heavy vehicles is high. Last year out of the 33,851 drivers examined 1,888 failed, while more than 13,000 failed to renew their heavy duty vehicles licences. “Although the driver of a heavy vehicle has a huge responsibility to maintain the vehicle, a majority are employed temporarily and work on a daily basis, so they have no interest in maintenance, a police officer charged. He said many of these long distance drivers are guilty of driving recklessly going downhill on neutral carrying full loads, driving too close to other vehicles and using mobile phones while driving. Commenting on the situation in Mahiyangana where heavy vehicles hauling sand and granite are a common sight, the area traffic OIC Nuwan Ranawera said driver exhaustion was a major reason for accidents. He said the drivers hauling heavy loads start their road trip around 6 or 7 p.m. from Mahiyangana and drive overnight to their destinations. They rarely take breaks. “The situation worsens when many drivers then work also in the day time, without resting. Some drivers work more than 18 hours at a stretch, with some of them making two or more trips to earn some extra money.This is illegal and exceeds the number of trips allowed as per the permit.